"Gandalf's Garden mystical magazine flourished in the rougher end of the King's Road, London, during the fabulous 'Flower-Power' years from 1968-1972. The vision of its creator/editor Muz Murray was to produce an antidote to the anarchistic and nihilistic hedonism of the Underground journals of the 'Swinging Sixties'... For those unfortunates who missed the heady days of the Sixties here at last we reproduce all six magazines." So reads the blurb on the backing-sheet accompanying this new (2007) CD-ROM. I don't think I need to add anything much more for those who don't have the original magazine, except to say that you should get this disc now, no question. It contains the six issues in all their colourful glory, in relatively straightforward-to-use pdf format, and as easy to read as the magazine itself (by which I mean that some people had difficulty with the colour combinations on a few of the pages, though I personally never found that to be a problem). But what about those of you who already have your copies of magazine and still treasure them? Is there more material on the CD-ROM which would justify your buying it? The answer is an undoubted yes. The first thing to note about the Gandalf's Garden CD-ROM is that it looks gorgeous, thanks to new, incredibly detailed, case slip and disc artwork by erstwhile GG artist John Hurford. Once you load up the CD-ROM the menu offers much more in addition to the magazines themselves. One highlight for me is the artwork section, which includes several posters, some of them unfinished and previously unpublished, but my favourite is the rather lovely cover for the planned but never published GG issue 7 - a "Chinese Mystics Issue". 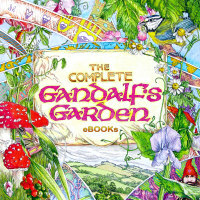 Another section contains fifteen contemporary photographs of Gandalf's Garden, the shop and its people, taken by Colin Bord (you can find some of these on this web site, but there are more on the disc). Then there are reminiscences, some of them lengthy, from six of the Gardeners - Jaya Bear, Keri Jinks, Lyn Gardenchild, 'Smiley' John Hallaway, John 'MadAece' Power and Gerry Snelling (and fascinating 'now' photographs of most of them) - with added notes from Muz Murray . Not all of the reminiscences are 100% complimentary, but most are, and everyone seems to have got a lot from GG which they carried with them. All continued with alternative lifestyles in some shape or form, and none of them seem to have joined the 'greyworld'. A large section comprises newspaper and magazine write-ups and reviews charting the life of GG in all its forms from 1968 to 1972; and another big section contains various reviews and comments on GG from web sites (including this one!) and books. Here you'll also find more details from Muz on the infamous banning of a GG advertisement, and the police raid on the shop (nothing was found - GG was a drug-free zone: something the regular world never really got back then, and probably still doesn't now). Among the book quotes is one from Gary Lachman's addictive (I've read it three times!) but very flawed Turn Off Your Mind (2001), to which Muz responds by rightly taking issue with some of the author's assertions about GG. In particular he's pretty angry with Lachman's hints that there might have been a connection between GG and the Process. This section ends on a high note with two pages of tributes to GG received after it closed. I've saved the best 'extra' on the disc till last: a 21-page autobiographical article by Muz on "The Life and Times of Gandalf's Garden: or How Did Your Garden Grow?". Muz starts by describing the vibe in the sixties out of which GG grew; then follows with an account of how the magazine was first conceived, how it developed and the inevitable trials of trying to publish it on a regular basis with hardly any money and (to begin with) a near-complete lack of publishing experience. The rise of the GG shop is covered; and there are anecdotes about the GG community and the problems which their cramped living conditions produced. Muz also examines the causes of GG's end in some detail. The whole essay is written in an extremely readable style, with many snippets of information which were completely new to me, ranging from the Jimi Hendrix connection (how different things might have been if he hadn't died when he did) to the fact that a leading ice-cream manufacturer once wanted to name a cone after GG! This article is pretty much worth the price of the CD on its own, in my opinion! And Muz ends on an inspirational note: "The transformation of the quality of life on our planet has hardly begun. But don't evangelise. Just live your dream and let others catch up when they are ready". August 9, 2007. Copyright (c) 2007 Rosemary Pardoe.